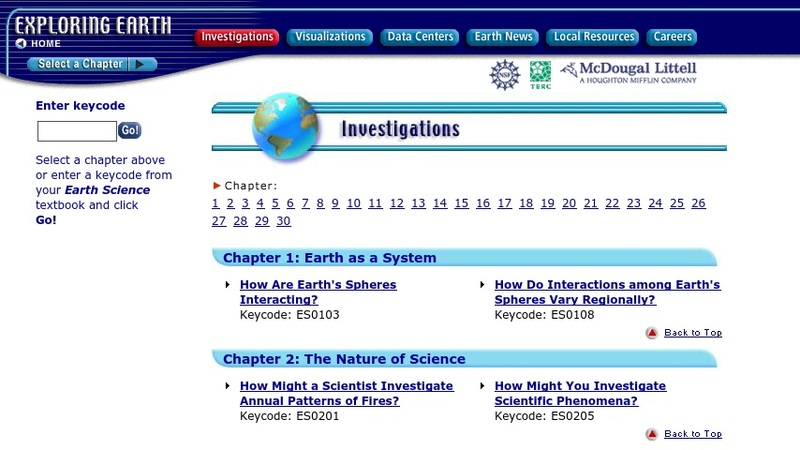 These visualizations and internet-based activities were designed to accompany the high-school textbook "Earth Science" (McDougal Littell), but may be used as stand-alone activities. They use animations, interactive graphics, and imagery to help students gather information about a particular Earth science theme, issue, or concept. For each investigation, students examine a sequence of web pages on which they manipulate graphics or interpret image data. The pages contain background text and questions to help guide students' thinking. Topics include Earth as a system, the Earth's structure and motion, minerals, rocks, plate tectonics, volcanoes, earthquakes, and many others.